I found this down an alley the other day, how could I go past it without photographing it?
. I’m so excited to get the book! I’ve ordered it tonight. The experience of helping make this film, of being on set and being behind the scenes, was truly one of the highlights of my career and I’m so pleased to be able to relive that through this hardcover book. I went to see the film the other day, there was a cast and crew showing. I love the visual quality, the creatures and the setting and everything was perfect. I wasn’t so sold on the story, I have to say, but talking to a friend of mine afterwards, he said something that helped enormously with my understanding of the film. 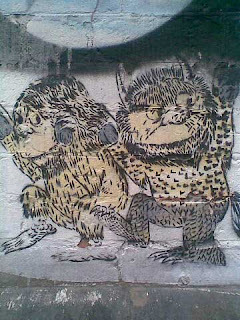 I was unsatisfied with the Wild Things characters, they didn’t seem to learn anything or even move on from when we met them until when we leave them in the film. 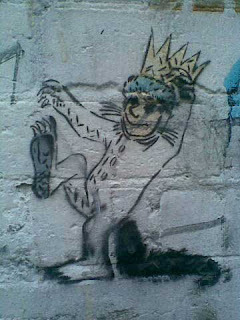 But once the idea that all the Wild Things were previously children who have followed (or forged) Max’s path but let themselves be taken over with the Wild Thing spirit, and have stopped being children and have totally become the Wild Things. That’s why they don’t progress during the film – they’re stuck as who they are*. I have to say that a) I didn’t get that from the film at all, and b) it made the film SO much cooler! I wish, I wish it had of come through more in the film itself. My friend was on set most of the time and thus privy to the inside workings and thinkings of the film, which is how he formed this reading of the film. So my advice to you is to take this knowledge into your viewing of the movie. It’ll make it so much better! But the very exciting news is that not only are there already photobooks of the story of the film, but there is a Making-Of book out as well, called Heads On and We Shoot: The Making of Where the Wild Things Are . Being a part of creating this film, being both on set and behind the scenes, was truly a highlight of my career and I’m so pleased that I can relive those feelings and sights through this beautiful hardcover book. I can’t wait to see it! * the main evidence of this is Daniel, the Bull, which is the quiet one that doesn’t appear to take part in all the other guy’s actions, he still has human feet, signifying that he hasn’t quite made the total change from human to Wild Thing. It’s a very subtle hint to this reading of the film, so don’t fret if you’ve seen it and missed it. I was thinking more about the film and really, it was beautiful. And I was dreadfully excited to see scenes I was around for the shooting or helped with the creatures. The beautiful owls, for instance, I spent two whole weeks steaming feathers. If you’ve never steamed a feather, the up side is that they unfurl and straighten like a flower unfolding and it’s quite beautiful to watch. The downside is that you’ll end up smelling like damn chooks all day. Not really my favourite of smells. I am taking a group of kids from school next week, I love the book so much I am almost scared to see the movie ! Oh, that's great! I'd be really interested in knowing what you thought and how the kids reacted to it! i am going to go see wild things this week hopefully – will be looking out for your name in the credits. yay!